n Wednesday July 8, at around 3.00 pm, the engine drivers, railway guards and a few other affiliated trade unions -- with no prior notice -- suddenly went on strike. The union representatives tell us that the salary anomalies due to these workers have not been met by the government over a time. With the cost of living skyrocketing, one could not be blamed for feeling the poor engine drivers, station masters, railway guards et al were justified in demanding their dues. But, their sudden strike, with no prior notice, left thousands of office workers with no real alternative to find means of transport to their homes. Even worse, many hundreds, if not thousands of school children preparing for the GCE A/level exam were left in a quandary. Scenes at the country’s main station were pathetic, mothers with crying little children left high and dry. Suddenly the strike became the ‘straw’ which so-to-say ‘broke the camels back’. 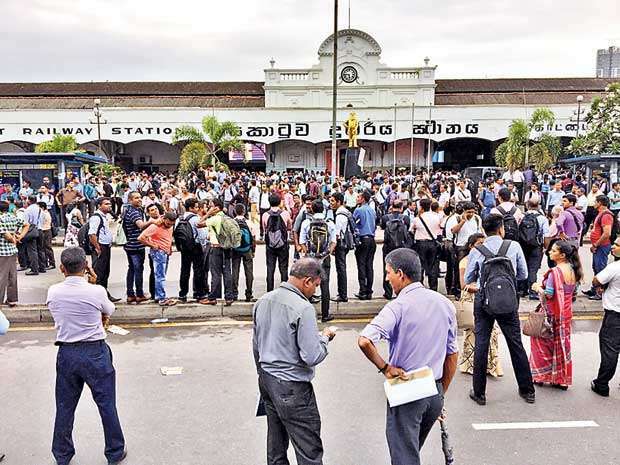 Angry commuters stoned railway buildings and went in search of railway workers to take out their anger. Fortunately, timely police intervention prevented this section of ‘public servants’ from being manhandled by irate commuters -- the mass of poorer sections in our society forced to depend on the public transport system and who can ill-afford private transport. The richer classes are not, and will not be affected by these and other strikes which are called, especially because it is the poor who are dependent on these services. It would appear that the engine drivers and the railway guards are blissfully unaware of the problems of the poor, burdened by the ever rising cost of living. But then engine drivers and railway guards are among the highest paid category of employees in the country (not of course counting doctors, CEOs and super executives in the mercantile sector). While a government graduate teacher receives a measly sum of around Rs. 33,340/- per month as starting salary for the essential service he/she provides the country for moulding the future citizens, or a Grama Niladhari receiving anything between Rs.15,000/- to 20,000/- per month, or a Samurdhi Niladhari receiving around Rs.18,000/- a month; a Railway Engine Driver earns a total of around Rs. 275,000/- a month. A Railway guard around Rs.186,000/- a month and a Railway Station Master Rs.163,000/- monthly. Pity these poor workers of whose take-home pay is on average; a princely Rs. 208,000/-! Little wonder they call wildcat strikes greatly inconveniencing the public. Their reality is in sharp contrast to those of the ordinary masses of this country. Unlike ‘Oliver’, in Charles Dickens novel ‘Oliver Twist’, these workers are not asking for more, they are demanding more, and holding the poor to ransom to achieve their demands. But then, the railway workers are merely emulating the example of an even higher-paid category of government servants -- the doctors -- who without batting an eyelid, take the Hypocratical Oath, with no intention of ever keeping it. This band of ‘public servants’, ‘prosperous members of a once noble profession’ as Prof. A.N.I. Ekanayaka, Emeritus Professor & former Dean Faculty of Dental Science, Peradeniya refers to them; go on strike with nary a care for the millions whom they have sworn to care for. Today these worthies are demanding the scrapping an FTA agreement between the Sri Lankan government and the government of Singapore under which medically qualified doctors from that country would also be able to practise in Sri Lanka. A failure to do this doctors threaten, will force them to go on indefinite strike. While doctors claim their action is for public benefit, it appears otherwise. An increase in the number of doctors in the country would increase the patient-to-doctor ratio, thereby possibly endangering in the future, the present lucrative emoluments doctors now receive. The vocation of doctors is a concern for life and death. They along with the police and armed services normally do not resort to strike action, because it jeopardizes the lives of people. Additionally, doctors like the engine drivers and their like-minded comrades-in-arms who suddenly went on strike on August 8, study and receive training free -- at great cost to the millions of poor citizens of this country. They owe a debt of gratitude to the millions of poor who pay for their education. Unfortunately, the poor are only repaid by these ‘public servants’ who are also free of the burden of paying income tax, with wildcat strikes and other absurdities.